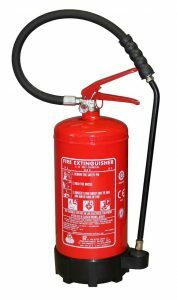 We can supply the best quality in a wide range of fire extinguishers and give you correct and straight forward advice on the types of fire extinguishers you would need for your premises. Every building needs the right type of fire extinguisher protection. Let us take you every step of the way with a completely custom solution to cater for all your needs. 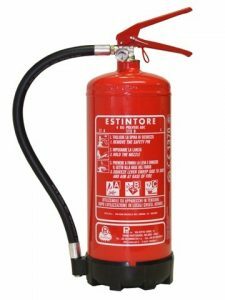 Which fire extinguishers do I need? There are many types of extinguishers for many different types of fire so it is easy to get confused and feel lost when trying to decide what exactly it is you need. That’s where we come in. Our experience in this trade can identify exactly what you need! 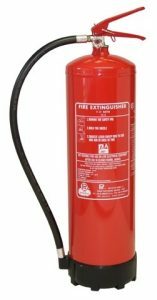 Water extinguishers are suitable for Class A type fires involving combustible materials such as wood, paper and fabrics. Water is a fast and efficient means of extinguishing these materials. It works by having a rapid cooling effect, so that insufficient heat remains to sustain burning and continuous ignition ceases. Foam spray extinguishers (AFFF), are ideal for multi-risk situations where both Class A combustible materials and Class B flammable liquid risks are likely to be found. 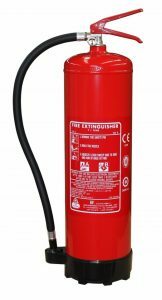 Foam spray extinguishers are especially suitable for Class B fires involving flammable liquids such as oils, spirits, greases, fats and certain plastics. CO2 (carbon dioxide) extinguishers are for class B and C fires. They don’t work very well on class A fires because the material usually reignites. CO2 extinguishers have an advantage over dry chemical in that they leave behind no harmful residue. That makes carbon dioxide a good choice for an electrical fire involving a computer or other delicate instrument. 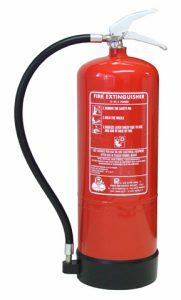 Powder extinguishers are suitable for use on Class A, B and also Class C type fires involving flammable gases such as propane and butane. Powder is also highly effective for electrical hazards. This multi-purpose powder interferes with the combustion process and provides rapid-fire knock down. Dry Powder Class D extinguishers are similar to dry chemical except that they extinguish the fire by separating the fuel from the oxygen element or by removing the heat element of the triangle of fire. However, dry powder extinguishers are for Class D or combustible metal fires such as aluminium, magnesium, titanium etc. They are ineffective on all other classes of fires. 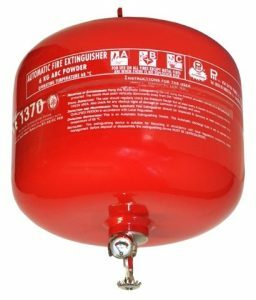 Wet Chemical extinguishers are suitable for use on Class A & F Fires. 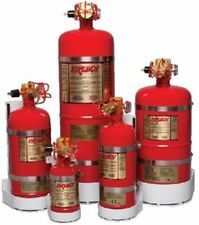 These ranges of extinguishers are specialists in regards to cooking fires caused by fat and oils. Extinguishers such as Water, Foam, Powder & CO2 will not always put out big cooking fires and are also extremely dangerous because the pressure of these extinguishers can cause the oil to jet out and cause serious harm. 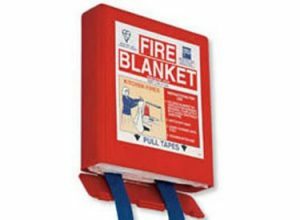 A fire blanket is a safety device designed to extinguish small incipient (starting) fires. It consists of a sheet of fire retardant material which is placed over a fire in order to smother it Small fire blankets, such as for use in kitchens and around the home, are usually made of fiberglass and are folded into a quick-release contraption for ease of storage. Fire blankets, along with fire extinguishers, are fire safety items that can be useful in case of a fire. These nonflammable blankets are helpful in temperatures up to 900 degrees and are useful in smothering small fires by not allowing any oxygen to the fire. Due to its simplicity, a fire blanket may be more helpful for someone who is inexperienced with fire extinguishers. 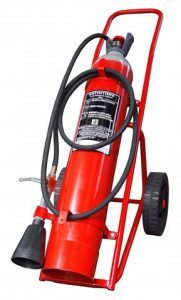 Dry Powder Automatic Fire Extinguisher has become widely recognised and trusted, it has become well known for its high quality finish and reliability. 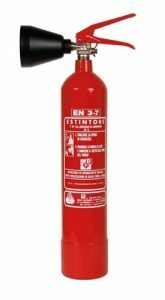 This Extinguisher is designed to protect and combat fires in the engine compartments such as in boats or large vehicles. Only one unit should be installed in any one compartment in order to provide the total protection required for that area. Wheeled Fire Extinguishers, available in AFFF Foam, ABC Dry Powder and Co2 (Carbon Dioxide). Our sizes range 50Ltrs for the AFFF Foam and 50Kgs for the ABC Dry Powder and from 10Kg to 50Kg on the Co2 (Carbon Dioxide). 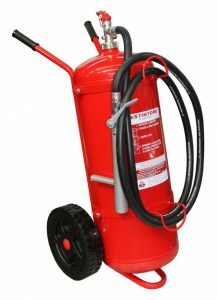 All our Wheeled Fire Extinguishers are a Stored Pressure type unit. 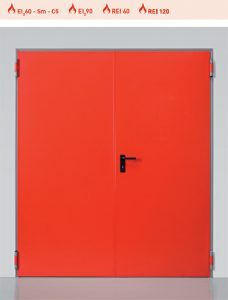 Fire Doors are an essential part on building operators to make sure fire doors and escape doors are installed and maintained as fit for purpose. Effective fire doors will restrict the spread of fire and smoke and therefore help to save lives and prevent injury in a fire.